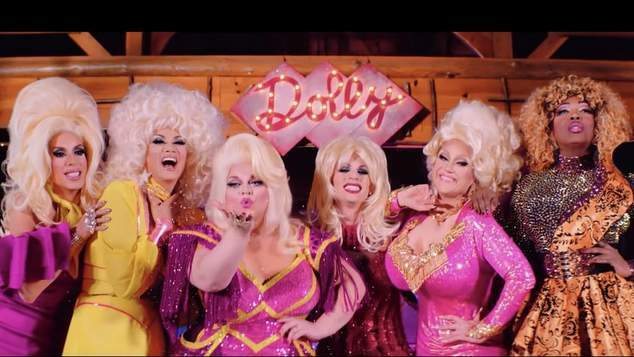 Six stars of RuPaul’s Drag Race have delivered their best lip-sync of Dolly Parton’s classic hit Jolene to celebrate the release of Dumplin’ on Netflix. The new movie is inspired by the country singer’s empowering songs and the soundtrack features a wide selection of artists recording some of Parton’s tunes. To show their love for Dolly – Ginger Minj, Manila Luzon, Alaska, BenDeLaCreme, Bebe Zahara Benet, and Katya gave it their best lip-sync. Based on the 2015 novel by Texas-based author Julie Murphy, Dumplin’ tells the story of Willodean Dickson, the overweight daughter of a former pageant winner slash current pageant host, who signs up for her mom’s Miss Teen Blue Bonnet pageant as a tribute to her late Aunt Lucy. Willodean has inherited her aunt’s love of Parton’s music. The film stars Jennifer Aniston and Danielle Macdonald, while drag star Ginger Minj also has a small part in the film. Check out the clip, and watch Dumpin’ on Netflix.